Northern Ireland put a dent in England's World Cup hopes as David Healy's goal gave them a stunning win. Leeds striker Healy fired home Steve Davis' pass after 73 minutes to give Lawrie Sanchez's side their first victory against England since 1972. It capped a nightmare England display, in which a petulant Wayne Rooney picked up a yellow card that rules him out of the next qualifier against Austria. David Beckham came closest for England, hitting the bar with a free-kick. England's game plan, with Rooney wide on the left and Beckham in a midfield holding role, failed miserably. But they will still qualify if they win their last two games, against Austria and Poland. England manager Sven-Goran Eriksson's growing band of critics were provided with an almost limitless supply of ammunition by an abject performance. It was Eriksson's first defeat in a qualifier, but sheer joy for Northern Ireland. Eriksson, as expected, recalled Newcastle's new £17m striker Michael Owen, with Joe Cole dropping down to the bench. But the first 45 minutes was sheer frustration for England against a dogged Northern Ireland side - illustrated perfectly by the sight of Rooney losing his cool completely in the closing stages of the half. He was deservedly booked, and could have been sent off, for raising his arm in a challenge on Keith Gillespie. Rooney looked out of control as he reacted angrily to an attempt by captain Beckham to calm him down, and brushed aside Manchester United team-mate Rio Ferdinand as the teams left the field at the interval. England had few moments of danger, coming closest to a goal after 27 minutes when Beckham's brilliant free-kick clipped the angle of post and bar. And Owen had a half-chance on the stroke of half-time when his overhead kick was clutched by Maik Taylor. Eriksson made a change early in the second half, sending on Cole for Shaun Wright-Phillips. Chelsea's Frank Lampard had been quiet, but he forced a brilliant save from Taylor on the hour when he turned away a 25-yard effort. 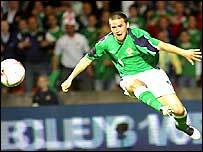 England had a scare after 71 minutes when Healy's cross deflected off Jamie Carragher and Paul Robinson had to dive bravely at the feet of James Quinn. Northern Ireland had more than held their own after the break, and Windsor Park was in ecstasy after 73 minutes as Healy put them in front. He collected Davis' neat pass and fired high across Robinson into the top corner. Eriksson immediately attempted to salvage the situation, replacing the bitterly disappointing Steven Gerrard with Jermain Defoe. Owen almost snatched a late leveller for England with a diving header, but Taylor came to the rescue. And in the dying seconds, subsitute Warren Feeney almost added a second for the home side, his shot rolling inches wide. Northern Ireland: Taylor, Baird, Capaldi, Hughes, Craigan, Davis, Gillespie, Johnson, Healy (Sproule 88), Quinn (Feeney 79), Elliott (Duff 90). Subs Not Used: Ingham, Robinson, Jones, Brunt. England: Robinson, Young, Ferdinand, Carragher, Ashley Cole, Lampard (Hargreaves 80), Beckham, Gerrard (Defoe 75), Wright-Phillips (Joe Cole 54), Owen, Rooney. Subs Not Used: Upson, Kirkland, Neville, Bent.